As electric forklifts become more popular and prevalent in the workplace, they have brought additional safety concerns with them. Electric forklifts are inherently quieter making it more difficult for workers to quickly acknowledge the presence of a lift truck. Therefore, some of the most important innovations to modern forklifts have been to address these safety concerns, providing more advanced warning and creating a safer environment.As electric forklifts become more popular and prevalent in the workplace, they have brought additional safety concerns with them. Electric forklifts are inherently quieter making it more difficult for workers to quickly acknowledge the presence of a lift truck. Therefore, some of the most important innovations to modern forklifts have been to address these safety concerns, providing more advanced warning and creating a safer environment. Lights A variety of lights are available to either make operation safer for the operator or to provide warning in preparation for those near a forklift in operation: For many years, both flood lights and strobe lights have been available to make the forklift more visible while in motion and to offer more light for the operator within darker areas and trailers; newer to the scene are Pedestrian lights, often known as blue lights, which alert pedestrians to an oncoming forklift by projecting a beam of light about 10 feet either in front of or behind a moving forklift. 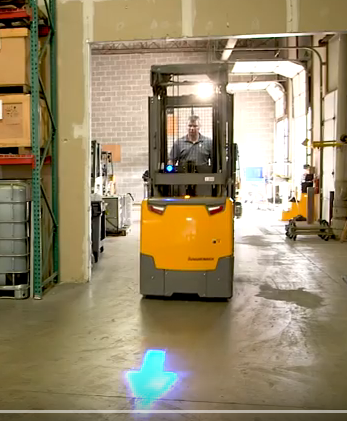 This is particularly helpful when working within intersecting aisles; and, Boundary lights illuminate lighting onto the ground to the sides of a lift truck, providing a guide to pedestrians of a safe distance to remain from a moving fork lift. Motion Alarms Modern electric forklifts are incredibly quiet, and thus often pose a danger to pedestrians unaware of their presence. Motion alarms provide an audible alert to those that may be in the path of a lift truck. There are even “smart” motion alarms which automatically adjust their level of sound depending on the ambient noise around them. Speed Limits It is important to set speed limits and for operators to practice these safe travel speeds always. Slower trucks make for safer trucks. Many factors must be considered to determine safe speeds including the type of truck, load being carried, surface conditions and pedestrian presence. These items help contribute to a safer environment for both operators and bystanders alike. Atlantic Lift Truck values safety and is committed to integrating safety training in delivering solutions to meet customer needs. Watch below for more information on these safety options and visit atlanticlift.com.